Access roles in EasyQA test management tool. Distribution of access roles is an essential element in any system. We have tried to make the EasyQA test manangement tool convenient and clear to use by any user. Thus, we have worked hard on the organization and project roles. First, all the roles available on the website can be divided into two general groups: organization roles and project roles. Owner is a basic role. After registering at the website you can create your organization and automatically become its Owner. To create an organization you just click on Add organization button. Having created the organization you will be redirected to the page with your organizations. Click on the newly created organization to access it. That’s it. You have opened your newly created organization and you are the Owner (it is proved by the notification 'You are Owner'). Let us discuss the organization roles. You can find the detailed list of each role’s rights at the end of the article (organization and project roles respectively). Owner can appoint the admin or user role to any person added to the organization. To do so, you open the Organization Members tab and change Organization Role to the one you need. II. Administrator has similar rights as the Owner except for the right to edit or delete the organization. This means that the Administrator is a person who is to manage the organization on behalf of the Owner. 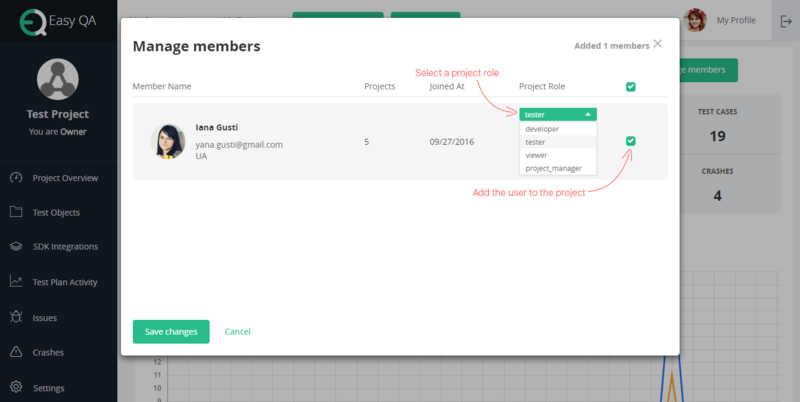 This person can manage projects and members but they are unable to delete the organization. We consider the Owner to be the only person having the right to delete it. III. User has the most restricted rights in the organization. This role is appointed to people who work in the organization but have no right of managing it. These are employees involved in projects. 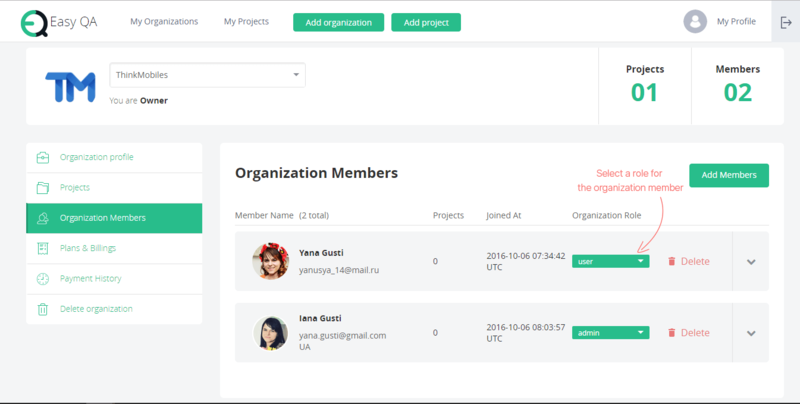 The User is able to look through the organization information, its members and the projects where they participate but unable to change anything. The Owner or Administrator can add any number of people and appoint them on any of these four roles. Each role has its own opportunities and rights concerning the project content. Let’s consider each role’s features. The main Developer’s duty is to upload a new build in the project. Viewer role provides the most restricted rules in the project. The User with this role has no opportunity to change anything. They can only view the info. This role is appointed to a person if there is a need to show the project’s stage, a test plan or a test case. It is very convenient to appoint this role without any additional settings and not worrying that the person will be able to change something in the project. You can appoint this role to the Client or to the person who monitors project development but is not a part of the team. These might be marketing specialists or business analytics. We believe that such access rights authorization is the most appropriate for the convenient EasyQA test management tool using in the organization as well as in the projects. There is the table below providing the comparison of the organization and project access rights for each role which will help you understand the access rights authorization better.